Why Haul for Interstate Transport? We get that strong relationships are built from the inside out. Why Should You Join the Interstate Transport Team? Your working experience at Interstate Transport is a big deal to us. It all starts with a headquarters located in paradise, a.k.a. St. Petersburg, Florida. Known for its sunshine, walkability and high quality of life, St. Pete has received numerous accolades from national and international publications for being: The Best Mid-Sized Arts City, An Up and Coming City for Millennials, Best City to Retire and Best City to Staycation. We even made it on The New York Times Top Places to Visit list in 2014. Interstate Transport offers a great work environment with competitive pay, health benefits, an attractive 401k plan with matching, and several company outings per year. We're proud to say that this positive culture has resulted in one of the most experienced teams in logistics with the lowest rate of turnover in the industry. Including early release times when work is completed, fun, company-funded events and excursions, and a dedication to hiring from within. Employees enjoy a relaxed dress code and casual environment with a highly productive and rewarding atmosphere. Located in the heart of downtown St. Pete, team members have access to dozens of options for food and entertainment. From technology to training, Interstate Transport provides staff with the tools and the opportunity to succeed, regardless of previous experience. We fully support every team member's desire for growth and self-improvement. 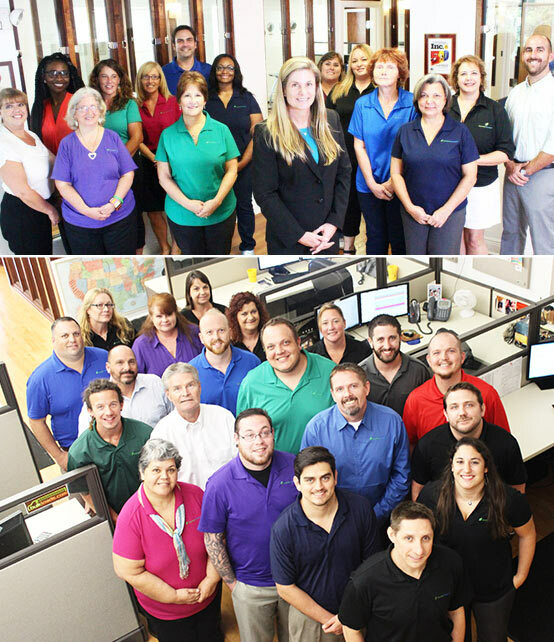 Interstate Transport's management prides itself on an open door policy that's based on honesty, respect and support for each team member's desire to learn. Our executives instill an atmosphere of teamwork while still recognizing each member's individual contributions. Most companies say it, but don't really mean it. Interstate Transport believes that your personal life is key to overall happiness and productivity. Interstate's family-friendly workplace is evident through our policies and practices. Interstate Transport combines paid sick and vacation time into a paid-time-off system (PTO), empowering employees to make their own decisions regarding the amount of vacation and personal time spent away from work. View current opportunities to join the Interstate Transport team. "I love the wonderful people and family environment at the office." "The owner is very approachable." "I like the office location in downtown St. Petersburg. It makes for an easy commute everyday and with all of the restaurants and clubs nearby its easy to socialize after work with co-workers." "I love the atmosphere and how everyone is so willing to help one another. At the end of the day we are a team, and we treat each other as such. It makes Interstate a wonderful place to work in my book." "I am thankful for a workplace and a supervisor that have accommodated me leaving for my appointments and allowing me to make up my time as needed." "Interstate provides the necessary tools to excel in the logistics industry no matter your previous experience." "My co-workers are great to work with and I'm always busy, which I love." "The office atmosphere is relaxed and comfortable, but manages to remain professional. (And Interstate does have the coolest office building in town!)" "Working at Interstate has been an amazing experience all around."